That yellow sign signals BIG savings. 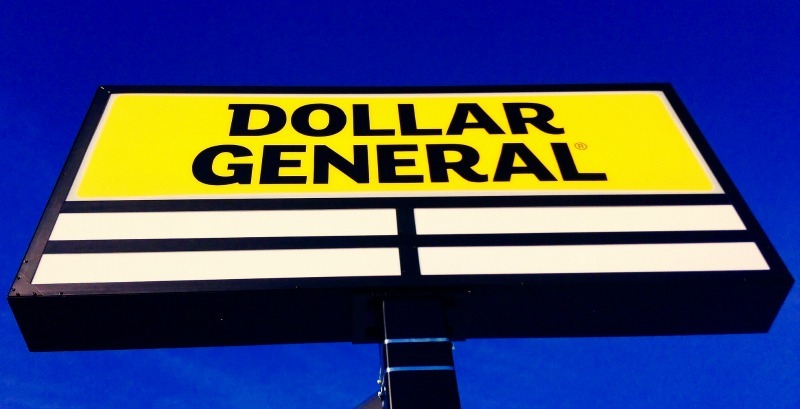 Here’s how to score the best Dollar General teacher discounts, grants and everyday savings! In less than one minute you can register for Dollar General Digital Coupons, which allow you to access a slew of $1, $2 and even $5 off coupons that are only available online. Just click the ones you want, and then visit your local DG. When you check out, your phone number is your DG Digital Coupons ID and lets you redeem all clipped coupons at the register. No need to carry a card or physical coupons! Plus, you get a $1 off your next purchase just by signing up. 2. Shop DG’s store brands. If you thought your big box or grocery’s store brand was reasonably priced, you haven’t shopped DG store brands. (One of our recent comparisons on a teacher essential: Febreeze Odor Eliminator was $3.99 at our grocery, whereas DG Odor Eliminator is $1.50…both for the same size spray bottle!) Look for food items named Clover Valley, Good & Smart and Sweet Smiles. DG’s exclusive self care items include DG Body, DG Health and DG Baby. The Studio Selection line is DG’s low-priced dupes of your favorite makeup and haircare brands. 3. Look out for Dollar General teacher discounts in May and August. Dollar General historically has Teacher Appreciation discounts in May for Teacher Appreciation Month and early August for Back to School season. Check with your store manager about those seasonal savings, and be sure to bring your school ID when they’re in effect. 4. Check the Dollar General weekly ad for insane deals. We know it will make you feel like a grandma, but you really have to check out the Dollar General weekly ad. That’s where you are going to find the jaw-dropping steals for your region. This is an ideal place to get the lowest prices anywhere on classroom stock-up essentials like paper towels, hand sanitizer and pencils. Review the weekly ad online each week to stay up to date on the deals. For those times you just pop in to the DG, be sure to grab a newsprint version at the front of the store so as not to miss a sale. 5. Sign up for Dollar General Auto Delivery. Not only are DG’s prices crazy low, you can sign up for the crazy convenience of having your essentials delivered to you regularly with DG Auto Delivery. All Auto Delivery orders garner you a 5% savings on top of their regular low prices, and shipping is free on orders over $25. You can schedule your deliveries at whatever interval works best for you, and adjust or cancel at any time. 6. Join the Dollar General Shave Crew. If you or your partner have signed up for other shave clubs (in which you have razor blades regularly delivered), switch to the DG Shave Crew. You’ll save 25 percent compared with Harry’s or Gillette On Demand! DG Shave Crew has those five-blade cartridges with a lubricating strip that we all love. With your first order, you receive a free handle, loaded with a razor cartridge. Shipping is always free, with no minimum purchase required for DG Shave Crew subscribers. 7. Apply for a Dollar General Literacy Grant. Dollar General Literacy Grants are awarded to organizations that provide direct services to family literacy, children’s literacy, Parent and Child Together Time (PACT), summer reading, adults in need of literacy assistance in the areas of adult basic education, GED or high school equivalency preparation and English language acquisition. The grants go up to $15,000. Some grant deadlines are February 19-21, 2019, depending on your program. Youth literacy grant applications for schools are available on February 28, 2019 and will be due by May 16, 2019. Get more information on Dollar General Literacy grants. 8. Follow Dollar General on Facebook for discounts. Dollar General’s Facebook page regularly posts special coupons and big sale alerts. 9. Sign up for Dollar General mobile alerts. DG Mobile Alerts sends offers and coupons straight to your phone. Just text SIGNUP to 34898. You will receive 12 messages per month with the best sales. 10. Check out Dollar General’s online school supply section. DG’s online office and school supply section is so stocked, you’ll be stoked. And the everyday prices are lower than office supply stores during back to school season! 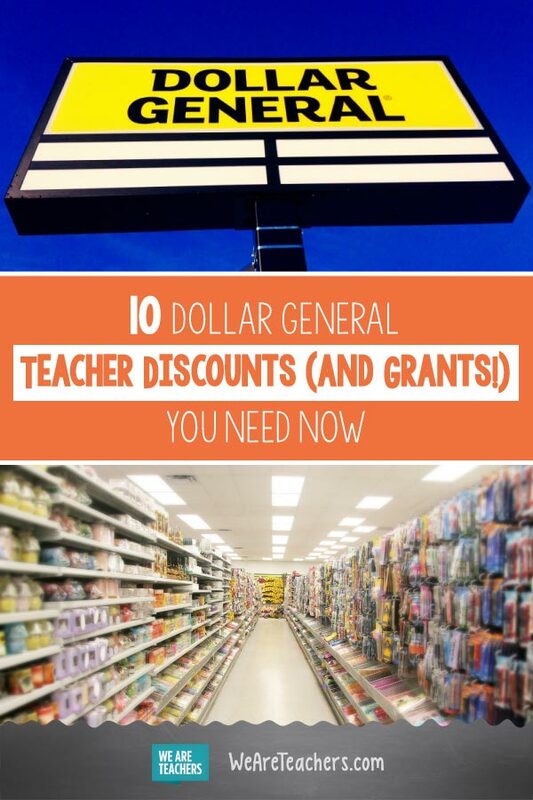 What is your best Dollar General teacher discount tip? Share in our WeAreTeachers HELPLINE group on Facebook. Photo credit: Mike Mozart on Flickr.